This film is long overdue. Playing in the “The Picture is Up” Program at this year’s Worldwide Short Film Festival in Toronto is Richard Shepard's (“The Matador”) ode to John Cazale, one of the great unsung character actors from the 70’s who tragically died after only making five pictures. 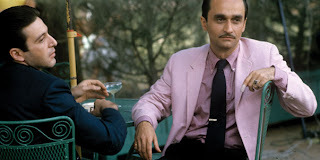 If you don’t know who John Cazale is you certainly you know his unforgettable face, and certainly his signature character – Fredo – the hapless older brother of the “Godfather’s” Corleone family. The picture, told in traditional documentary style, assembles some of the great actors and directors who worked with and were influenced by Cazale to produce a reverent portrait of this uniquely talented actor. At the top Shepard lists the five films he made, “The Godfather”, “The Conversation”, “The Godfather Part II”, “Dog Day Afternoon” and “The Deer Hunter” – all FIVE of which were nominated for Best Picture. A stunning track record. Unfortunately Cazale died tragically of lung cancer in 1978 leaving his then girlfriend Meryl Streep heartbroken. His colleagues such as Al Pacino, Francis Coppola, Robert De Niro, Gene Hackman all give wonderful anecdotes about his intense process of acting. Richard Dreyfuss makes an astute comment about Cazale’s dedication as artist. He says, actors always want to play the strong characters, and even when they have to play a weak one, they have a way of overplaying it to show the audience that it’s the character they’re playing. But Cazale had a way of playing weakness in his eyes, a method of ultimate humility to the character at the sacrifice of all ego and pretention. Younger actors like Steve Buscemi, Sam Rockwell, Philip Seymour Hoffman wax reverentially on the smallest details of his performances which brought life to his characters and his films. A look of the eyes, a movement with his feet, or a gesture with his hands, the power of Cazale's performance seemed to be in the naturalistic details of his movement - like those Brando-esque nuances, moments so memorable for these great actors, which influenced their careers. Shepard’s film is a must see for fans of cinema, and in particular 70’s cinema, of which Cazale was such an important figure. If you can’t be in Toronto to catch the screening, it was produced by HBO, which means it will likely air sometime on television in the near future. Enjoy. "I Knew It Was You" plays at Toronto's Worldwide Short Film Festival, which runs June 16-21. Of the "new generation" of actors, I found Sam Rockwell's comments the most thoughtful. He and Buscemi were both enjoyable. Maybe because he was so general and un-specific in his remarks, I thought Philip Seymour Hoffman was the least worth his screen time in this scant 40-minute "tribute film." P.S.H. was just sort of generically pompous about acting.